We check in on the built-not-bought Hondas going crapcan racing. 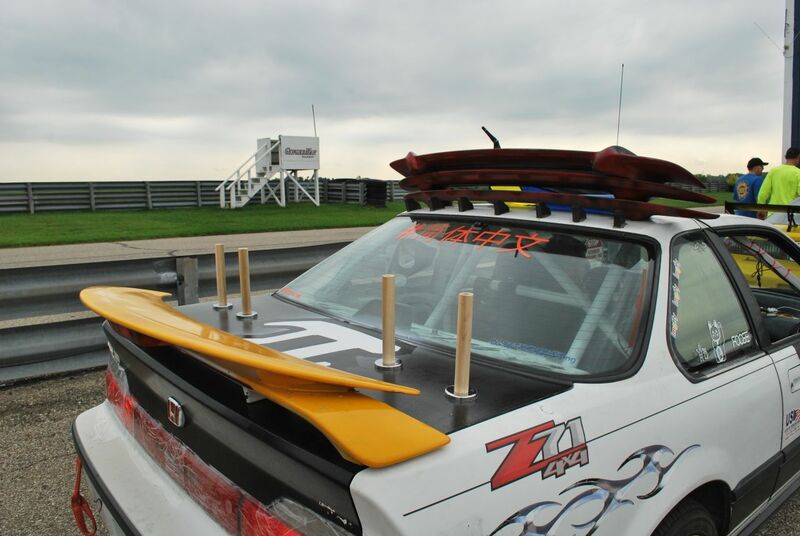 Last weekend, we checked out the 24 Hours of LeMons race at Gingerman Raceway in South Haven, Michigan. For those not in the know, LeMons is a racing series for cars that are bought and prepared for $500, excluding safety equipment (Read the rules here). After a safety inspection and a “BS inspection” to determine if the car falls under the series’ assessment of $500, the cars then race for more than 14 hours over two days. The winner logs the most laps in that time. Naturally, Honda-Tech readers will know that Hondas make great cheap cars for commuting or tuning or whatever, so it should come as no surprise that nine of the 77 LeMons cars at Gingerman were Hondas. Here’s the quick rundown on the Hondas at that race. A former race-winner, the Team Sheen car has lasted several years of racing since, well, Charlie Sheen’s famous interview. The team usually finds Top 10 by the weekend’s end thanks to clean, consistent driving. The car is a non-VTEC B18B1 that has run more than a dozen races on the same block, albeit with the occasional head gasket change. Very few teams have been around LeMons longer than these guys. They ran their first race in 2007 back when crapcan racing was a new thing. Their original second-generation Integra, one of the few left from 2007, got totaled by an automotive journalist at a non-LeMons race at Mid-Ohio in 2015. After that crash, team Non Sequitur transplanted the Integra’s B18 into an ‘89 Civic hatchback. Speaking of automotive journalists, a group of current and former Car and Driver writers fields this extraordinarily cheaty maroon Prelude. As noted above, automotive journalists are generally terrible at racing, and by those standards, Hell Kitty had a pretty uneventful race. So the cheating isn’t helping them much. Beneath the unassuming four-door Guy Fawkes facade lurks a B18-swapped Civic with eBay coilovers from some car that was definitely not a Civic. Ill-fitting as the suspension mods might be, the Anonymous Civic runs pretty well. Yes, that is garden edging used for side skirts and the team cut “speed holes” in the plastic bumper cover. LeMons is a silly thing. This is no high-performance Civic Si or anything. Instead, it’s a humdrum Civic coupe with 115 horsepower from a bone-stock D17A1. This is likely the most-stock Civic in the field and the best part is undoubtedly Callahan Auto Parts paint job that pays homage to the Chris Farley classic comedy film Tommy Boy. Wearing a “Prelude Express” livery, this Prelude team finished respectably in the middle of the 77-car field. At one time, they ran a pile of junkyard spoilers stacked on top of each other, though they ditched that for this race. They might have put that tiny bit of downforce to good use, but the (unintentional) four-wheel drift through Turn 11 at Gingerman was an exciting moment for one of the team’s drivers. The RSX has just started creeping into $500 territory for the enterprising junkyard dog. This team bought the car from a towing company lot in running order with only the slight detail of the entire roof having been caved in from a rollover. They got the car only a few weeks before the race and barely had time to pull out the rollover damage, so this was a completely stock RSX with an automatic transmission. They still copped a few penalty laps for being over-budget because their story wasn’t documented in any way—Pro tip: Bring a paper trail and a convincing story to LeMons—but 42nd place is pretty decent for a first-time team. The Buttlords were one of only two teams running a D-Series engine at this race. They sourced the car from someone who’d hacked it up a bit and they took a grinding wheel to the valve cover to see just how many layers of paint had been applied (at least three) over the course of its life. They struggled to make it run quite right, but they did flat-tow the car to its home about an hour away with one team member’s Pontiac G8. Once upon a time, this was a reliable race car in the hands of its first team, who sold the car to Legitimate Racing. The second owners have struggled mightily with electrical gremlins, but the A20 engine has generally been a successful engine against all odds in LeMons. This car sports the original carbureted A20, as well, which makes it one of very few carb’d Hondas in LeMons. You can read full coverage of the event on Roadkill.com. Check out a gallery with even more Hondas below.